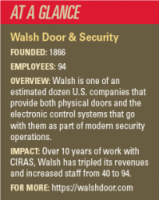 A Walsh employee handles finished doors. 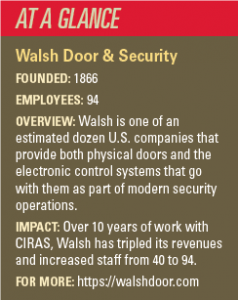 Established in 1866 by the current leadership’s great-great-grandfather, Walsh Door & Security has tripled its revenues over the past decade and grown from 40 employees to 94. Growth brought the need for continual refinement, and the business repeatedly has turned to CIRAS for help. CIRAS account manager Derek Thompson describes the Walsh relationship as typical of what happens when a business is serious about continuous improvement. Since 2015, CIRAS project manager Marc Schneider has helped the company improve its purchasing and inventory handling, while former CIRAS project manager Jim Poe (retired) helped Walsh reorganize its production and storage facilities to make them safer and more efficient. Company leaders also turned to CIRAS strategy coach Joy Donald for guidance with implementation of several strategic initiatives. > For more information, contact Derek Thompson at thompson@iastate.edu or 515-419-2163.